Vista Systems’ Spyder has become the image processor of choice for large professional sports installations implemented by Click Effects, whose line of digital content delivery systems are designed to meet the demands of live sports environments nationwide. 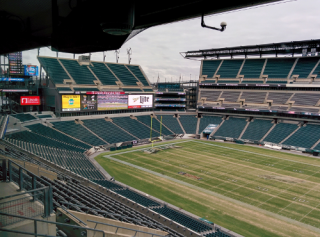 The most recent venue where Spyder plays a key role in Click Effects’ content delivery solution is Lincoln Financial Field, home of the NFL’s Philadelphia Eagles. In addition to Lincoln Financial Field, sports venues featuring Spyder include Bank of America Stadium, home of the NFL’s Carolina Panthers; NRG Stadium (formerly Reliant Stadium), home of the NFL’s Houston Texans; Toyota Center, home of the NBA’s Houston Rockets; American Airlines Center, home of the NBA’s Dallas Mavericks and NHL’s Dallas Stars; EnergySolutions Arena, home of the NBA’s Utah Jazz; and EverBank Field, home of the NFL’s Jacksonville Jaguars. To accomplish that feat operators marshal Crossfire systems, with HDSDI output, and Blaze systems, with DVI output; ten Crossfires handle L-Bar custom advertising alone. The LED displays, as well as the digital signage and ancillary displays, are so large that three Spyder X20 1608s are used. Content delivery includes live feeds, replays, animations, stats, advertising and crowd motivational videos. Before Lincoln Financial Field’s installation came online Click Effects’ most ambitious pro sports project was Houston’s NRG Stadium where “as many as eight to ten sources feed a display that’s nearly 200 feet wide,” says Stocker. “Spyder creates numerous windows then goes to a full-screen replay or animation. Spyder transitions smoothly to reveal stats, advertising and live video. Click Effects considers Spyder to be the go-to image processor for college sports installations. “Spyder is also a great choice for college venues,” Stocker reports. This fall at LSU’s Tiger Stadium in Baton Rouge a single Spyder X20 1608 is working in combination with more than ten Crossfire and Blaze systems to drive the big LED display.